Interview: This week, George Johnsen, Babylon 5 co-producer (and apparently one of Jeffrey’s cohorts in mischief), at last joins us! Jeffrey had been trying for a while to get George on the show, but George is a busy busy guy. He’s worked on a lot of the films and shows we love, and he loves the scifi! We talk to George about the show, including some of the questions sent in by listeners, and the anecdotes and production details are both fascinating and fall-down funny. This is an interview you have to hear again and again, and you won’t care that it runs the full hour. Guess what? Thanks to “Babylon Podcast” listener Don McMillan, Summer is finally going to get copies of the remaining TNT B5 promos! Yes, once they’re ready, we’ll make them available for you to listen to and download. Awesome show! 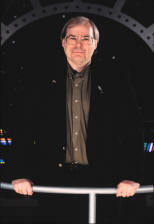 It was wonderful having George Johnsen on the show sharing his memories of Babylon 5 with Jeffrey and the rest of us. George did something quite amazing with Babylon 5 that really did change how the industry handles post- production. I hope you do more interviews of this sort. Thanks so much. OK double Wow with a cherry on top. That was a fantastic interview. And George was a great guest. Congrats to everyone involved. Fantastic interview. George is awesome. It was amusing and informative. I’ve only just started listening. I hope you interview more of the technical folks behind B5! Great interview—you need to have him back again!